Each baby makes their own way into the world, which doesn’t always line up with what we hope and plan for the little one’s birthing journey. I admire this sweet woman who showed so much strength through out her birthing journey. S and J started care with me in the second trimester of S’s third pregnancy. S had two previous surgical births and after much research, felt home birth was her best chance for a VBAC (vaginal birth after cesarean). Pregnancy progressed on uncomplicated. At 4 days passed her due date, contractions became more regular and stronger than what she had been feeling over the past couple weeks. Contractions were 6-12 minutes apart all night and strong enough to wake her up. After she got some rest, she got up around 615am and contractions regulated quickly to 3-4 minutes apart, and S began to pass her mucus plug. I recommended S make some breakfast and take a walk and see what happens. S called me at 846am to let me know her water had just broke. She was feeling nauseated and ran to the bathroom and her waters released in the toilet. S was going to take a walk and see what happened. I arrived at 1150am to find S laboring on the ball. I did the initial assessments and everything was normal. Baby was in a LOT (left occiput transverse) position. I did the initial intake exam at 1210pm and found S to be 4cm dilated, 50% effaced and baby at a -2 position. Her cervix was soft and posterior. Based on baby’s position, I suggested S try a few things to see if it would help baby rotate and move into the pelvis. I first suggested S do an abdominal lift and tuck for 10 contractions to see if that would help. S happily moved around her bedroom, lifting her belly with surges and moving her hips, trying to encourage baby to move down. S then did side lunges with hip circles on each leg for a few contractions on each side. More of the birth team began filtering in over this time. S’s legs were getting tired, so I suggested she try hands and knees and I would sift her belly with a rebozo. This helps loosen the ligaments as well as jiggles baby’s head. S’s doula jumped in and alternated with me on the sifting. I then suggested doing a side lying release on both legs to help open the pelvis. One thing I really loved about S is that she was game for anything I suggested. She wanted a VBAC, and was willing to do anything to help this goal happen. 2pm neared and S moved to her birth ball, rocking her hips with contractions. Contractions were coming every 2.5-3 minutes and lasting 75 seconds in length at this point. When I felt S’s fundus, the contractions felt moderate in intensity. S was surrounded with support. Her doula used the rebozo to lift her belly for comfort during surges, and used cool compresses to cool her down when she felt warm. I encouraged S to eat and she decided she could do a smoothie and one of her family members made her a smoothie. I encouraged S to get on her feet and move around for a few contractions during the 3pm hour. Her mother came to labor with her during this time, and provided counter pressure on her back during surges. After some time, J came and slow danced with S during some surges. It is always so beautiful to see a couple connect with each other while working to bring their baby earth side. Since it had been four hours since the last exam, S agreed to do another exam to see what progress had been made. Her cervix felt the same as the previous exam. S was feeling tired and emotional. We got S comfortable on her side, and let her and J have some time together to rest and connect. After S got some rest, she was ready to work again! I assisted S with ten abdominal lift and tucks using the rebozo. Then my apprentice R worked on S’s sacrum, to encourage the fascia and ligaments to loosen. Then, I discussed with S about doing walcher’s maneuver for three contractions. I am hesitant to use that position because it is very uncomfortable, but S was such a champ. Contractions continued to be 2-3 minutes apart. S ate a peanut butter and jelly sandwich between contractions. After she got some nourishment, I asked S if she would be willing to try an open knee chest position in the bed for 40 minutes, combined with myself or her doula coming in and doing the “booty shake” with the rebozo every few minutes to help relax the pelvic floor and jiggle the baby. S was more than willing. Contractions spaced to 5 minutes apart, lasting 60 seconds in length in this position, allowing S to get some rest between. After her time in that position, I asked S to get in a semi reclining position. S felt that the contractions were much stronger in this position, and was able to more effectively rest in between her labor waves. Another 4 hours had passed, and S agreed to another exam. We were all disappointed to find that her cervix had made no change, and baby was not well applied to the cervix. I discussed with S and J that we needed to start considering our hospital options. We went over all their questions and concerns. They decided they wanted to go outside and walk as the sun was setting. I wrapped S’s belly with her moby wrap and her and J went outside for a walk. They arrived back right before 9pm and stated they were ready to transport and wanted to transport to Ben Taub where they could continue to labor. S and J began packing with the help of others in their birth team while I called ahead and gave the on call doctor a report. Soon we were on the road, arriving to the hospital a little after 10pm. There was a slight delay, but S was finally in a labor and delivery room by 1130pm. She was given an exam and found to be the same dilation as she was at home. The on call doctor discussed placing an IUPC (Intrauterine Pressure Catheter) to measure the strength of her contractions so that they could give her the right amount of pitocin. A few minutes passed and we noticed the baby having a significant deceleration during a contraction. They couldn’t find the heart rate with the external monitor, so the doctor quickly appeared and placed an internal monitor. The next contraction baby looked fine. The nurse and I alternated S’s position back and forth to keep the baby happy, but soon it was clear that baby wasn’t handling labor well anymore. Each contraction brought variable deep decels that weren’t resolving with oxygen or position changes. A couple doctors came in and spoke with S and recommended a surgical birth. After a moment, I asked S if she wanted my opinion and she shook her head yes. I told her that even though this isn’t what any of us wanted, I think baby was telling us that it was time for her to come and I think a cesarean was the best option right now. They began prepping her for surgery and soon took her back to the OR. It soon became apparent why the baby wouldn’t descend and why the baby began going into distress. When they began the surgery, it became clear that S had an abnormal amount of scar tissue, so much that her uterus had adhered to her bladder. 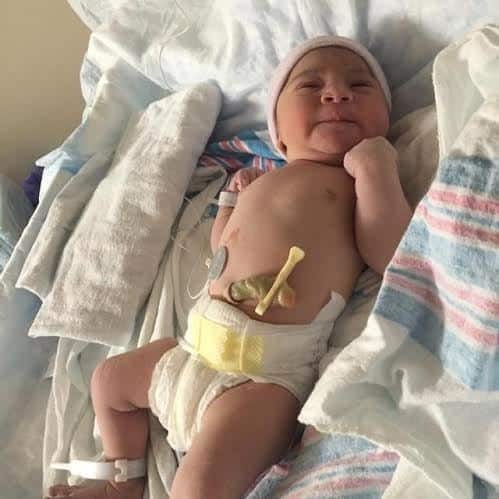 They had to maneuver around her bladder to get the baby out safely and not cause damage to her bladder, causing them to make a high incision. Welcome to the world Aurora, born earthside on May 10, 2016, weighing in at 7lbs 9ozs, 20″ in length. As soon as we could get her to the breast, Aurora quickly figured out what to do! She is so loved by her older brother and sister and has her daddy wrapped around her little finger! It was such a joy to serve this sweet family.